Google took Taiwanese company HTC mobile phone products (mobile) first called Nexus One. Because of the sophistication phone dubbed the "iPhone killer" (killer iPhone), Apple smartphone comes first on the market. 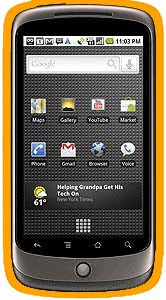 Nexus One was launched on Tuesday (5/1/2010). The phone is designed and manufactured by HTC's reportedly will be marketed through a new online store owned by Google, so the page is written in today's Technology Review. The phone is also called, according superphone Mario Queiroz, a Vice President of product management at Google, the company wants to make a call to demonstrate whether it is possible to run a mobile phone platform Android. Nexus One QSD uses Qualcomm 8250 processor 1 GHz, which is claimed is faster than the fastest smartphone processor already on the market today, Verizon Droid example with 550 megahertz processor, and the iPhone is expected to have a processor speed of about 600 megahertz. According to Tseng, Nexus One processor allows this phone to work in a multi-application occurs simultaneously with no slowdown, and supports a framework thanks to the 3-D Android version 2.1. Tseng demonstrated several applications displaying graphical display 3-D Nexus One, including the features of the full version of Google Earth. The phone will guide you with mapping software (maps) in the popular three-dimensional view, exploring the area and zoom in appearance. "We really want to push 3-D capabilities that you can with the chips to the limit of high-quality end," he said. Tseng also show some advanced voice capabilities, built on the software sound (voice) which is Google provided previously. In the Android 2.1, each text field will accept voice input, will allow users to send e-mails, text messages, and update (update) Twitter and Facebook without touching the phone. The job will be handled by Google servers. Tseng added that the software remains accurate sound for each user (the user).